On February 8 & 9, 2020, top American Indian and Canadian First Nations hoop dancers will compete at the Heard Museum for the prestigious World Champion title and cash prizes. At the two-day competition, men and women compete on an equal field. 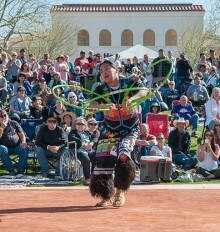 The art of hoop dance honors the cultural traditions from multiple Indigenous communities that first employed hoop dance as a healing ceremony. Today, hoop dance is shared as an artistic expression to celebrate, share and honor Indigenous traditions throughout the U.S. and Canada. Over the years, the art of hoop dance has grown, incorporating new and creative designs and intricate footwork while still respecting the fundamentals of hoop dance, a form of tribal dance that sets itself apart. Each dancer presents his or her own variation of the intertribal hoop dance, weaving in aspects of tradition and culture. Individual routines use as few as four to as many as 50 hoops, which are manipulated to create a variety of designs including animals, insects, and globes. Dancers are judged on a slate of five skills: precision, timing/rhythm, showmanship, creativity and speed. Contestants compete in one of five divisions: Tiny Tots (age 5 and younger), Youth (6-12), Teen (13-17), Adult (18-39) and Senior (40 and older). Through the stunning performances of both men and women who are vying to call themselves the World Champion Hoop Dancer, the event combines artistry, athleticism, tradition and suspense to present a memorable competition. NOTE: Lawn seating only. Please bring folding chairs or blankets to sit on. This is an outdoor event, so please plan accordingly for the weather. Bottled water is the only beverage that may be brought into this event. On-site registration will be available for $5.00 per dancer starting at 8 a.m. on Saturday morning, Feb. 10 in Steele Auditorium. Blessing and rules review will follow at 9 a.m. 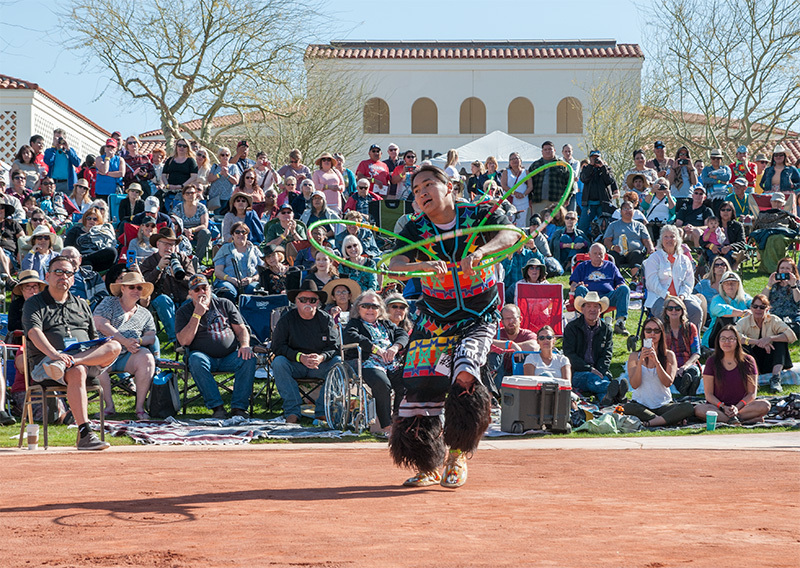 If you have not registered for previous Hoop Dance Championship Contests you will need to supply your tribal ID the day of the event or on your registration form. For information on signing up to compete, please contact Dan Hagerty at dhagerty@heard.org. Start time of each day's grand entry is approximate. Listed in Travelmag.com as one of the "Best Festivals" in Phoenix and Arizona in 2018.